From a better way to manage diabetes to preventing hair loss from chemotherapy, Cleveland Clinic offers a glimpse of 10 top medical innovations to expect in 2018. For the 15th year in a row, Cleveland Clinic this week revealed the top 10 innovations doctors at the prestigious healthcare system found worth watching over the next year. As is traditional, the unveiling came Wednesday at the close of Cleveland Clinic’s 2017 Medical Innovation Summit. A panel of Cleveland Clinic physicians and scientists choose the up-and-coming technologies to highlight. A screen snap of a hybrid closed-loop insulin delivery system, considered the first artificial pancreas, from YouTube. Hailed as the world's first artificial pancreas, the hybrid system helps make Type 1 diabetes more manageable. The technology enables direct communication between the continuous glucose monitoring device and insulin pump to stabilize blood glucose at an unprecedented level. The technology received FDA approval in 2016. It replaces the "open loop" concept that requires patient to use information from their continuous glucose monitor to determine how much insulin to inject. Experts are optimistic the outcomes demonstrated in Type 1 diabetes will accelerate a similar product for Type 2 diabetes patients. Screen snap of a sleep therapy device used for obstructive sleep apnea from YouTube. Sleep apnea, the most common sleep disturbance, affects 21 million Americans and can lead to high blood pressure, heart disease and stroke. While continuous positive airway pressure device –known as “C-PAP” is in wide use, more than 40 percent of sleep apnea patients refuse to wear the device, according to current estimates. A screen snap of how vectors deliver specific genes to specific cells to improve vision from YouTube. The FDA is expected to approve a new gene therapy for inherited retinal diseases in 2018.The ability to deliver a new gene to targeted cells in the body via viral "vectors" is likely to provide visual function improvements in some patients with IRDs. Caused by biallelic RPE65 mutations, these rare genetic conditions result in progressive vision loss and blindness. Currently, there are no FDA-approved treatments for them. This gene therapy delivers a "normal" working copy of the gene that results in a functional protein. Researchers place this gene inside a modified virus and this "vector" delivers it to retinal cells. In 2017, the FDA awarded orphan drug status to RPE65 gene therapy, and last week a panel of U.S. health advisers recommended approval for this approach. Screen snap of altered LDL receptors from YouTube. Low-density lipoprotein – LDL cholesterol – is known as bad cholesterol, bringing about fatty deposits that can clog arteries. With certain new drug combinations, LDL levels are reduced by 75 percent. While this stat is remarkable, say Cleveland Clinic doctors, many patients – and doctors –wonder how low is too low? A number of trials have been in progress recently testing this theory. So far, the floor has yet to be found. New studies reported a 20 percent reduction in the risk of cardiovascular death, myocardial infarction or stroke for patients who took statins combined with a new class of cholesterol-lowering drugs (PCSK9 inhibitors) to reach ultra-low LDL levels. Doctors now have the tools and the research to fight LDL cholesterol. Extending the healthcare environment to the patient's home has been a goal for decades. Removing geographic barriers to care can result in timelier, more efficient and more optimal outcomes as well as significant cost savings. Due to an increase in connectivity through mobile technology and consumer demand, hospitals are getting ready for widespread adoption in 2018. These technologies are also expanding beyond the simple two-way video platform. More patients are now equipped with attachable devices that record and report medical information to doctors to monitor their condition. More than 19 million patients are projected to use these remote monitoring devices in 2018. A screen snap of freeze-drying vaccines from Cleveland Clinic. In 2018, innovators will be upgrading the entire vaccine infrastructure to support the rapid development of new vaccines, as well as breaking ground on novel mechanisms to deliver new and existing vaccines to vast populations. For example, innovators are perfecting the use of freeze-drying vaccines, which can allow shipment to more remote locations. Companies are finding faster ways to develop flu vaccines using tobacco plants, insects and nanoparticles. At the point-of-care, innovators are thinking outside the syringe. Oral, edible and mucosally- delivered vaccines, intranasal vaccines, and vaccine chips are all under development. In 2018, a Band-Aid-sized patch for the flu vaccine is expected to be on the market. These new ways of developing, shipping, storing and vaccinating are being swiftly connected to stave off current and future diseases and epidemics. 2018 marks the year that targeted therapies are most widely used to treat breast cancer. A variety of new targeted treatments, such as PARP inhibitors for patients with specific mutations in BRCA1 or BRCA2, and novel CD K 4/6 inhibitors for ER-Positive/HER-2-negative breast cancer are having positive outcomes in clinical trials. Also, HER-2 targeted agents continue to show benefit in this subgroup of HER-2-positive patients. Experts believe the results from these studies are pointing to an increased survival rate, and perhaps the eventual end of chemotherapy for a significant population of breast cancer patients. Several centers have been developing the concept of "fast-track" or "enhanced" recovery after surgery. Research indicates that ERAS – "Enhanced Recovery After Surgery" – protocol that permits patients to eat before surgery, limits opioids by prescribing alternate medications, and encourages regular walking to reduce complication rates and speeds recovery. These protocols can reduce blood clots, nausea, infection, muscle atrophy, hospital stay and more. A centralized cardiac telemetry control room from Cleveland Clinic. Hospitals have long struggled with "alarm fatigue," when busy caregivers become desensitized to the constant noise emanating from cardiac telemetry monitoring systems. Reports indicate that up to 44 percent of inpatient cardiac arrests are not detected appropriately. Centralized monitoring has emerged as the answer, as part of a "mission control" operation in which off-site personnel use advanced equipment, including sensors and high-definition cameras to monitor blood pressure, heart rate, respiration and more. Complex data are assimilated to trigger on-site intervention when appropriate while filtering out unimportant alarms. In 2016, results from the CMU's first 13 months of using the standardized criteria were published showing that there's real hope of reducing rates of redundant or less significant alarms while improving clinical outcomes. A scalp-cooling cap from Cleveland Clinic. Newly diagnosed cancer patients have a lot to process. For women, the inevitable loss of hair is often one of the hardest. There is a new technology making its way to the U.S. that is looking to eliminate this problem from some patients' lists of worries. "Scalp cooling" – which works by reducing the temperature of the scalp a few degrees immediately before, during and after chemotherapy – has been shown to be effective for preserving hair in women receiving chemotherapy for early-stage breast cancer. The scalp cooling system was FDA approved in May 2017. 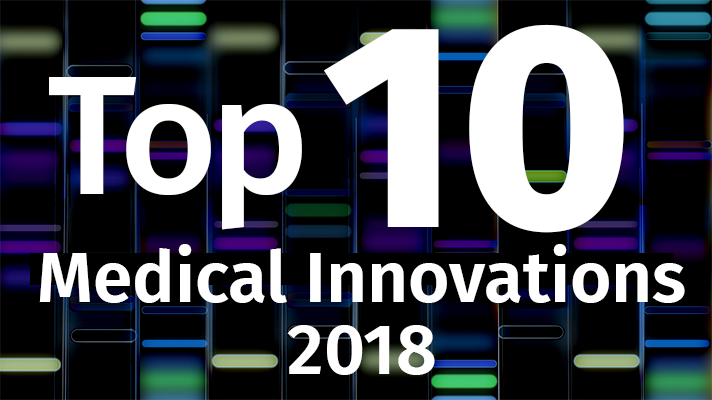 More information on the annual Top 10 Medical Innovations here.